2. You may get a warning message like this below, if so please click OK.
3. 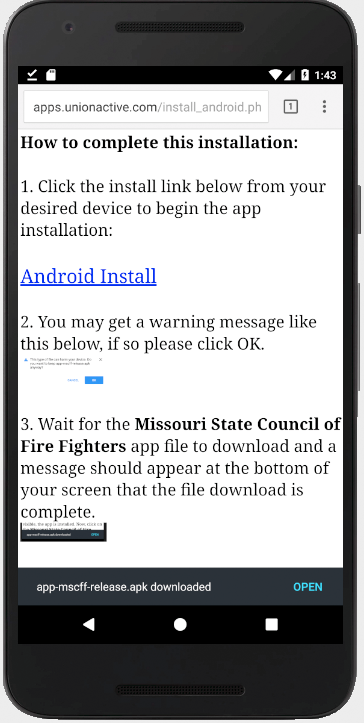 Wait for the IAFF 858 app file to download and a message should appear at the bottom of your screen that the file download is complete. Click the OPEN link in the message. 4. You will get prompted to install the IAFF 858 app. Click Install link at the bottom right hand corner. 5. 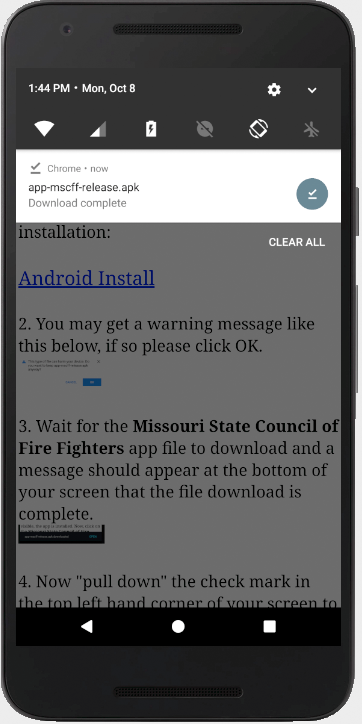 A confimation message should appear to indicate that you have installed the IAFF 858 app. Click open to run the app. You app install is COMPLETE! An app icon will also appear on your device. 1. Pull down" the check mark in the top left hand corner of your screen to view the file you just downloaded. 2. click the button with the checkmark underscored to install the app. 3. Continue on with #4 and #5 above.